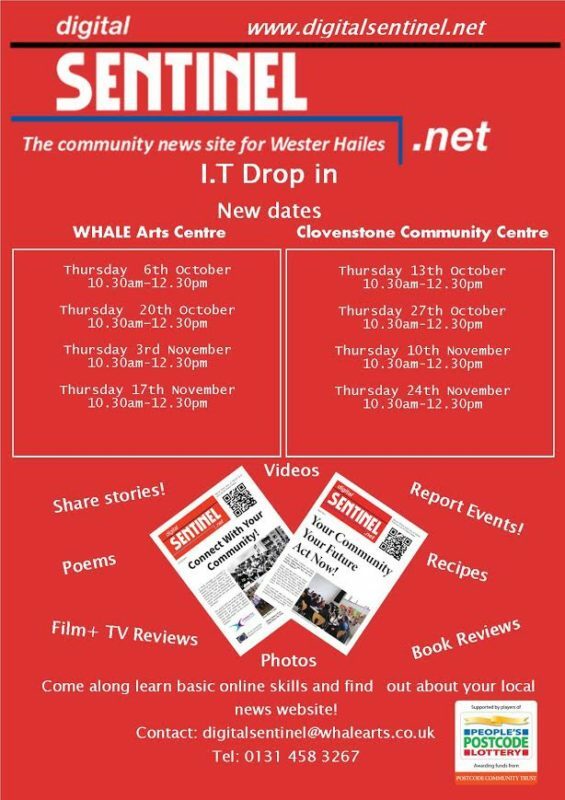 The Digital Sentinel team is pleased to announce their new I.T drop in dates for October and November. The dates will alternate between Whale Arts Centre and Clovenstone Community Centre. If you or anyone you know is interested in reporting on local news stories, sharing good news stories or has an interest in local media then please pop along. We can also provide FREE training for anyone who is interested in being a Community Reporter for the Digital Sentinel. Come along, tell us about any news or stories, learn basic online skills and get involved with your local news website. There is no need to book and people are free to stay for as long as they are able. If you have any questions or would like more information contact Craig at digitalsentinel@whalearts.co.uk or 0131 458 3267.